John Deere is an All American brand notorious for all types of power equipment, but they’re most iconic product is the tractor. This reputation has been built for many decades and for wide variety of reasons. Their D125 is one of many premium models that they produce, and it upholds their reputation for superiority. It features a 42” steel mowing deck specifically designed to cut grass perfectly even, and this was made obvious during our testing which revealed a seriously clean cutting path every single time. This model has been updated several times with new technologies and now includes an incredibly smooth hydrostatic transmission for smooth acceleration at the press of the gas pedal. 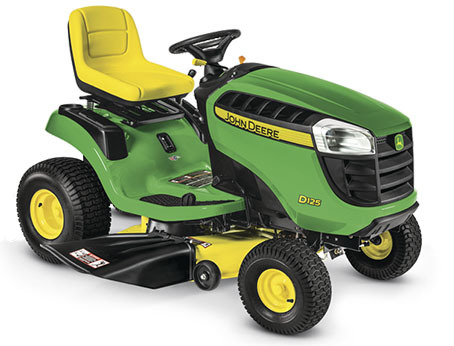 Its 20 HP John Deere engine is optimized for the job and provides ample power both efficiently and quietly. 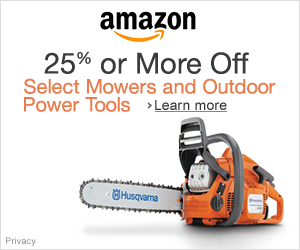 These features combined with many more make this one of the best lawn tractors available today. The John Deere D125 reminds us of exactly why the company is so well known for its power products. It is a high-end tractor that is made with precision and nearly perfect quality control. This was made evident during our mowing cycle which revealed beautifully cut grass that was both even and straightened. It drives like a performance car with smooth acceleration, deceleration, and cruise-control. 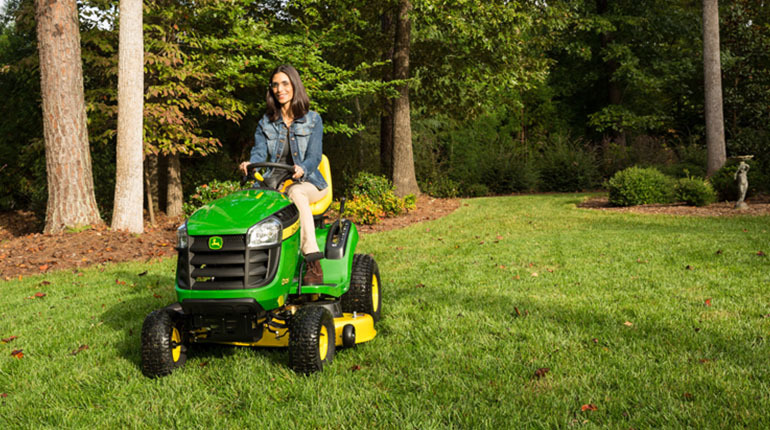 Thanks to the new hydrostatic transmission, the engine responds perfectly to the gas pedal, and this makes the mower an absolute pleasure to drive. We did notice the turning to be rather wide, but this is inevitable due to both the mower’s weight and size. Although the cornering was not the tightest, it was very smooth – just like you would expect. Everything was as described by John Deere’s website, and even if it weren’t, we know that all defects would be corrected promptly by the many service centers under warranty. The superiority of this tractor is undeniable.